WAIST HIGH: "Glad That You're Bound To Return!" "Glad That You're Bound To Return!" 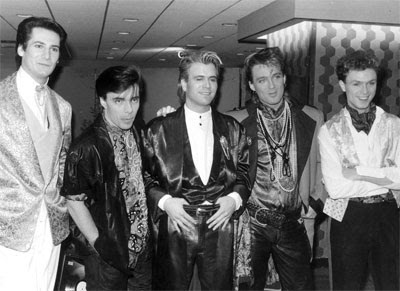 Spandau Ballet may re-form after singer Tony Hadley signalled he was ready to bury the hatchet after a bitter break-up. The eighties band had a spectacular fallout that ended up in Britain's High Court when Hadley, Steve Norman and John Keeble sued Gary Kemp for a million-pound share of the songwriting royalties, but lost. Kemp is said to have approached Hadley about a reunion for Live 8 in 2005 but was turned down. Now, Hadley says he's prepared to put the past behind him. He said on radio: "There'll have to be an awful lot of things remedied, because things did get personal and it went a bit too far. The next window of opportunity I see would be our 30th anniversary, in about four years."